The most famous cat in recent news—Lux, the “911 cat”—made headlines back in March when he attacked his family’s baby and held them hostage at their home in Oregon. The family called 911 for rescue, which then leaked to the media. Perhaps because of its sensational nature (whoever heard of a cat holding anyone hostage? ), the story went viral. And not long after that, Jackson Galaxy convinced Animal Planet to go back into production for season 5 of My Cat From Hell (even though they had stopped filming) in order to help Lux and broadcast it on TV. I’m not interested in anyone’s opinion on the family that owned Lux. What interests me is the medical component to the story. Jackson discovered that Lux suffered from a condition called feline hyperesthesia syndrome (FHS). FHS cats, for whatever reason, suffer from twitching that generally results in self-mutilation. It can happen at any time, though is usually exacerbated by stress (such as a baby pulling the cat’s tail). In Lux’s case, the condition is even more rare because he lashes out at those around him instead of himself. Still, what I like about this episode from Jackson, is that it brings to the forefront a condition that most people—even cat owners—have never even heard of. One of the cats at my shelter, Ambrosia, has FHS. She’s a pretty grey & white tabby, about 3.5 years old, and was transferred to Best Friends from a L.A. city shelter almost a year and a half ago. Ambrosia is a sweet cat. 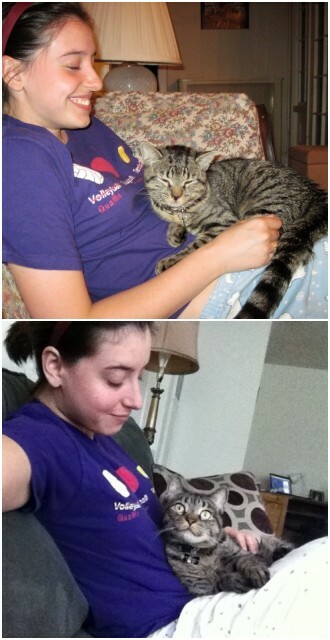 She’ll often climb onto your shoulder and rub against you when you open her cage. She can be sassy at times, but then, she’s been living in a cage-like setting for a long time. (A free-roam room or other housing options would be too stressful for her.) Her tail is partially amputated from her having self-mutilated it, but you wouldn’t notice it right away. Otherwise, she looks like a normal cat. Currently, Ambrosia is in one of our newer single cat cages up front. It’s great because she has more space than she used to, but I’d love to see her not in a cage at all. She’s one of the first cats visitors can see, and yet most people walk right on by her. Ambrosia is a healthy girl, provided she gets her medication. At first, the shelter tried to simply reduce her stress (which helped a lot in reducing episodes), but they finally decided to also do a drug trial. Ambrosia is currently on gabapentin—an anti-seizure medication—and so far, it seems to have made an even bigger improvement on her behavior. This will most likely need to be a life-long medication. Ambrosia was already one of the longest resident cats when I began working at Best Friends, and she never gets a serious look by visitors. It’s hard to, when there are plenty of sweet, friendly, young cats without any “issues” also available for adoption. Plus, most people have never heard of FHS. Ambrosia needs to be indoor-only, with someone who understands her condition and will take it seriously. So Ambrosia continues to be overlooked time and again. 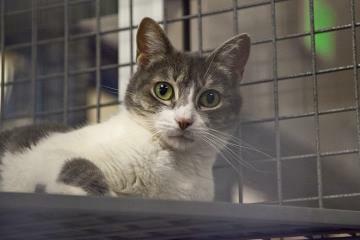 It is my hope that due to the recent media sensation of Lux the 911 cat, someone might come into the shelter and be open to adopting a cat like Ambrosia. Maybe a few more people will know what FHS is. It is my hope that Ambrosia, and all special needs cats, will find that special someone sometime soon. Together, let’s find Ambrosia a home. For more on feline hyperesthesia syndrome, click here and here.